I played out here mid-week after work. 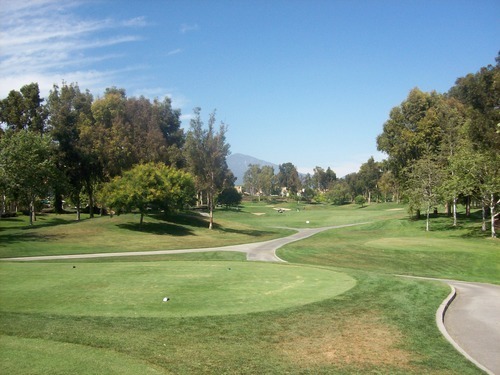 The main excuse to get out was for my first-round match in the GK Cup match play tournament for Greenskeeper.org. 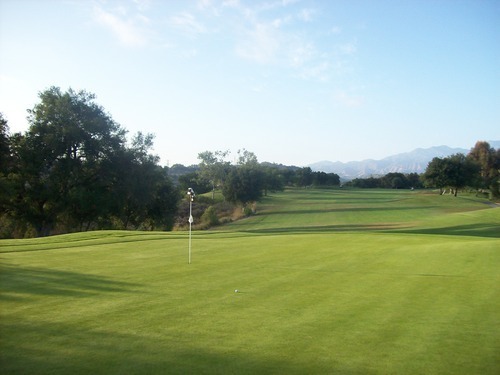 With the OB Sports discount card I recently won in a raffle at a GK event, I was able to get my partner and I a good rate on Tijeras Creek. Basically I can get out any day after 3:00pm for $40. That’s not terribly cheap for a weekday late afternoon round, but it is a fantastic deal for this usually expensive course. We had a 3:04 tee time, but the course was running a little late. It was really crowded out there for a Wednesday afternoon, so we teed off about 10 minutes after our time. The pace was pretty slow, but we were able to just finish before dark at a five-hour clip. Not ideal, but okay as long as we finished all 18. 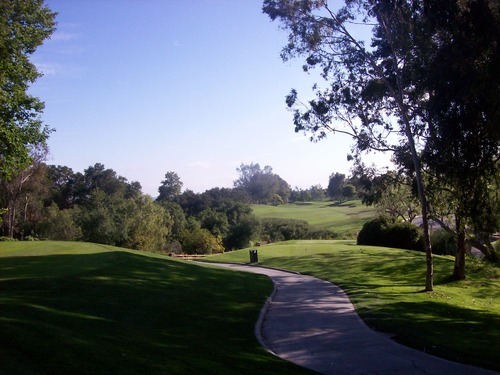 I’ve made it no secret that, though I live in the middle of Orange County, I don’t often play golf here because courses are generally overpriced and/or overcrowded. 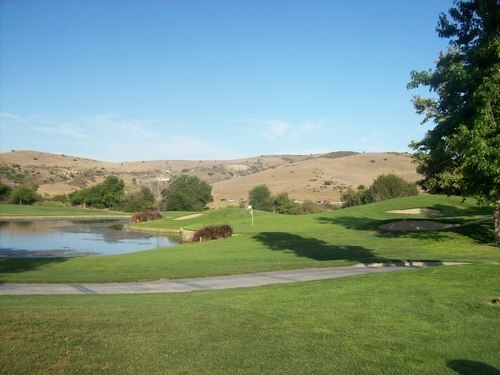 Tijeras falls into both categories most of the time, even though it is a really fantastic course and definitely my favorite layout in all of the county. The back nine here is truly enjoyable. Yet, the front nine is not to be overlooked. 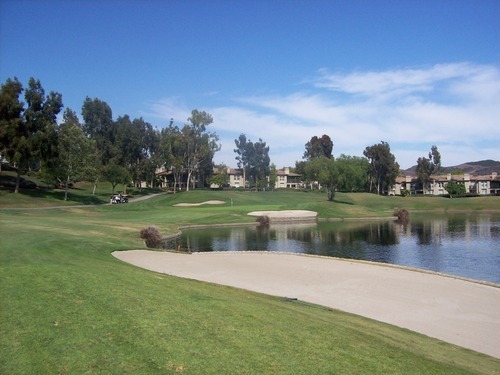 Though the scenery isn’t quite as nice as it winds through a residential area, there are some great holes. Numbers 4, 5, 7 and 9 all stand out to me as fun and challenging designs. 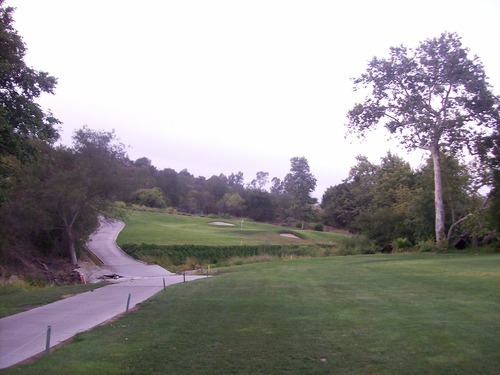 Holes 5 and 7 are two of the tougher par-3s you’ll find anywhere with water in front and the holes basically playing as all-carry with not too much bail-out room around the greens. 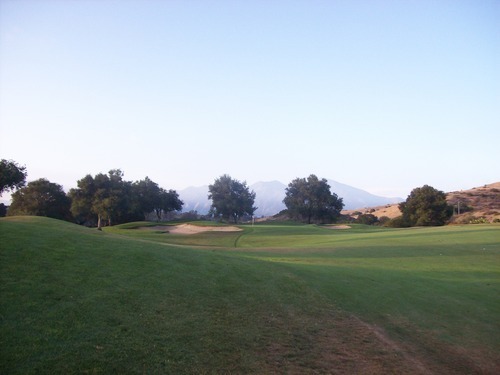 Then, you get to the back nine which is really a roller coaster ride as it runs along a tight ridgeline. 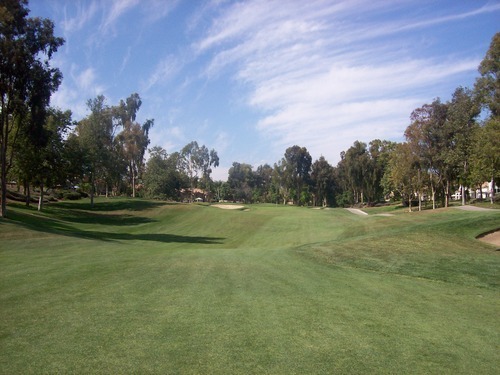 Holes 11 and 12 are especially memorable as they are very tight from tee to green. Most holes on the back nine aren’t terribly long, so this side plays with more of a “target” style. 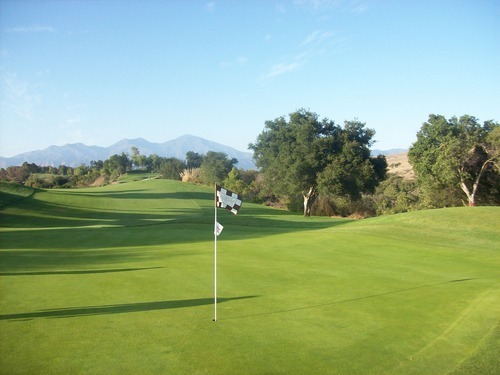 The priority here is to keep it out of the canyon, and if you can hit your spots, good scores can be had. 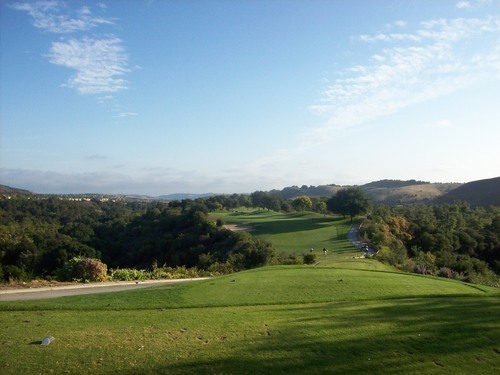 The 14th hole is the signature hole at Tijeras Creek and I believe it’s the best par-3 in the county. 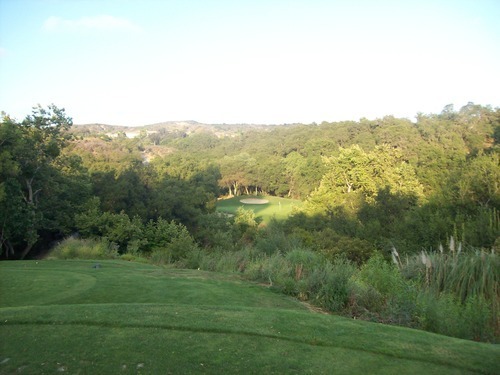 From the tee, the green down at the bottom of the hill almost appears to be a small island amongst the trees, brush and creek that runs in front. There is a little more room for error than you can see, but there’s still not much. 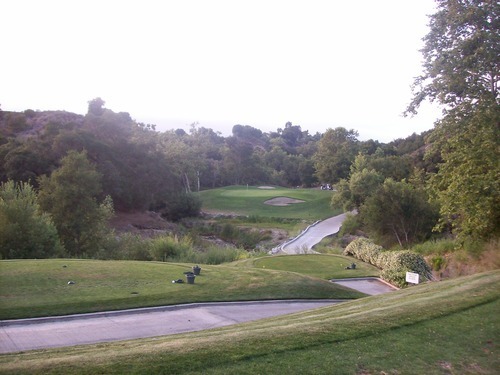 The 16th is another beautiful par-3 that is very memorable, as well. 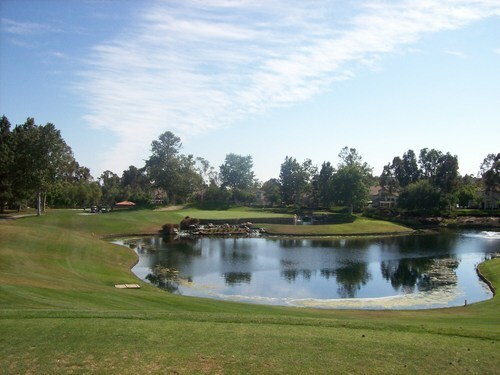 The 17th hole is a tricky one with positioning off the tee being crucial. The hole doglegs left with a daunting approach to an elevated green. 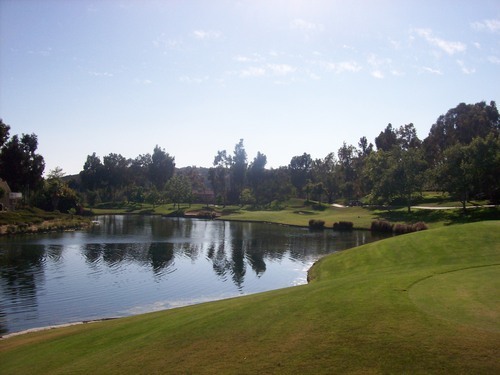 A big creek/barranca cuts across in front of the green and the putting surface itself has all sorts of tricky undulations. If you miss the green on any side, getting up and down is no easy task. 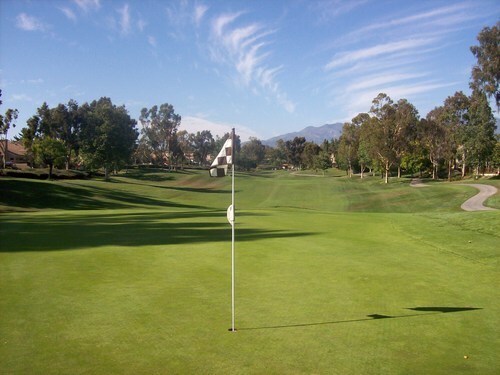 If you hit the green, you’ll often be happy just to walk away with a two-putt. 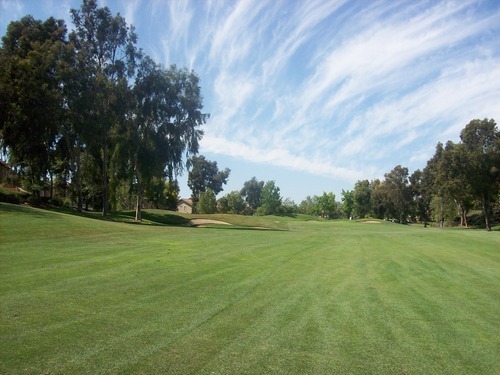 The course was in very good overall shape. The greens still seem to be recovering a bit from the last aeration as you can still see some bumps. They were naturally a bit bumpy this late in the day, as well. There were a lot of unrepaired ball marks, though, which is unfortunate to see golfers so carelessly ignoring basic etiquette. 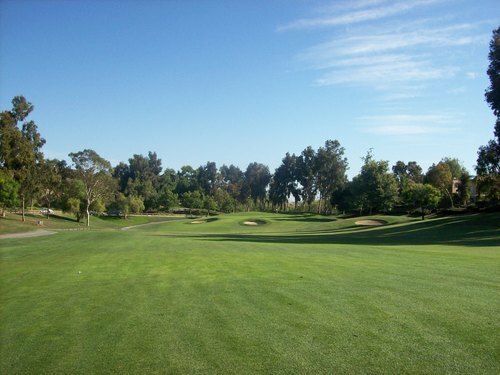 The fairways were nice—pretty lush and mostly green. There were a few mushy spots here and there that I noticed. The rough was mostly nice, but it did seem clumpy in some areas. Most times the ball would sit up nicely, but sometimes it would nestle down between two thick tufts of grass making it hard to get good contact. The only bunker I was in was a fairway trap and it was a good firmer consistency ideal for a fairway bunker shot. The tee boxes were good, but the par-3s were pretty chewed up—but that’s no real surprise that late in the day. As for my match, that went well. My first two attempts at match play didn’t go so well, but this turned out to be my first victory. It was a roller coaster of a match. Of the 17 holes that mattered in our outcome, we only halved three. So we were going back and forth. We both hit some great shots and some clutch putts, but we also each had a few meltdown moments. It was a very even match with our consistent inconsistency, but I ultimately pulled out a 2 & 1 victory! I’m looking forward to my next match, which should be in mid-July. 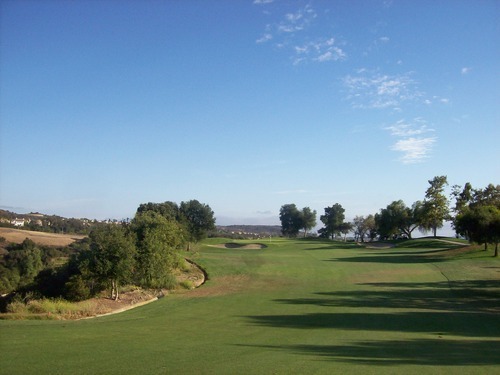 Note: Speaking of rematches, I returned to Tijeras Creek in 2015 and posted an updated review with a few new pictures. You can check out that review here.